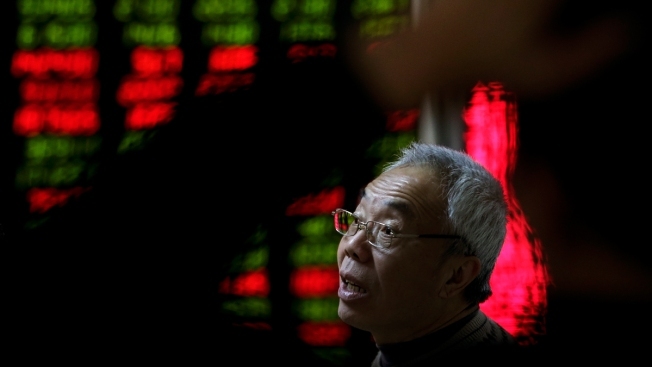 A man chats with other investors near an electronic board displaying stock prices at a brokerage house in Beijing. China opted to keep guiding its currency lower, pushing Asian stocks to a three-month low on Thursday, NBC News reported. Fears for the health of the Chinese economy has been reflected in the sharply lower yuan, and has been worrying investors. The Chinese currency fell to a record low since trading started in 2010. Financial markets fear the yuan’s depreciation may accelerate, meaning China’s economy is even weaker than imagined, and could spark more devaluations around Asia and in other key economies. Shanghai shares dropped more than 7 percent and trading was halted as the fall triggered a circuit breaker. Elsewhere, Japan’s Nikkei shed 1.5 percent, while shares in Australia lost 1.5 percent. South Korea’s KOSPI fell 1.4 percent, according to Reuters.